Today we are interviewing Craig Snodgrass, author of the children's picture book "The Clever Girl." I am a painter and illustrator of robots and other science fiction imagery. This is my first book, based on a story I made up for my daughter. 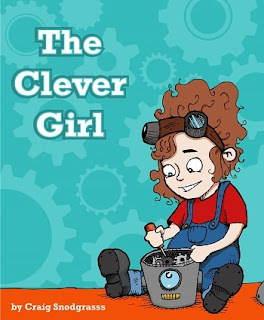 "The Clever Girl" is about a smart little girl that likes to build robots. They enjoy playing together in the woods. What inspired you to write a book about a girl who builds robots all day long? I also wanted to plant the seed that would show my daughter that the world of robots and engineering wasn’t off-limits to her because she’s a girl. So I used elements she is interested in like robots and playing outside to help her visualize the story. Do you think your background as an artist influenced how you tell stories? Totally. As I told this story I was constantly picturing what it would look like, and using words that would help my daughter be able to imagine it. Basically I made this story up on the fly one evening at bedtime. Over time and multiple re-tellings, the story began to take shape and develop its own cadence that my daughter would follow along with. A few weeks before my daughter's third birthday I decided I wanted to put it together for her as an actual book. So I broke the story up into pages and drew some rough sketches to go along. Then I assembled the pages into a working prototype. After showing it around I was encouraged to refine the art, etc and publish. So I got to work making better drawings for each page and cleaning up the text. After redrawing and inking the pages I then and colored the images digitally. I put the pages together in a layout program, created the cover and uploaded to Createspace.com. What medium did you use for the illustrations in this book? The line work was done traditionally using pencil and paper, then inking the lines with pens. The line art was then scanned in and colored digitally using Photoshop. Hard to say. Having a daughter I’ve read so many children’s books it would be difficult to narrow it down. I think it’s great. Just another medium to tell stories with. To write a lot more children’s book - perhaps to create a whole series of “Clever Girl” books. Not sure - I haven’t done it enough to not like it. Again - being a new “author” I haven’t had a to deal with writer's block. We’ll see what kind of story my daughter gets me to make up next. Check out my artwork on http://www.craigsnodgrassart.com.